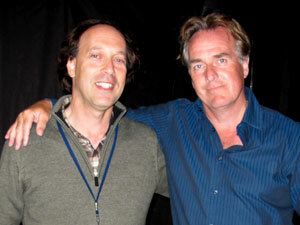 The Otherworld has captivated the brilliant minds and hearts of people like J.R.R. Tolkien (The Hobbit and The Lord of the Rings), C.S. Lewis (The Chronicles of Narnia), Lewis Carroll (Alice in Wonderland), Albert Einstein, and many others. All of them were one way or another involved in the doorway to the Otherworld. Einstein spent his life investigating the doorway. 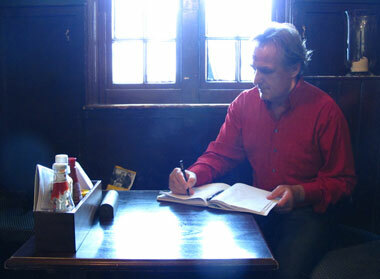 Tolkien and Lewis spent their lives looking through the door, and Carroll entered into it. Is the Otherworld all fiction and fantasy, or does it really exist? And what role do remote viewing and dimethyltryptamine (DMT) play in the Otherworld of Wiltshire England? The magical land where mythical animals, balls of light, crop circles, and power places show us that what we originally thought to be fantasy, is actually reality. The smell of a newly lit pipe and good brown beer fills the air. Through the haze of smoke one can see two men leaning forward and talking excitingly as they sit at the table in the corner near the bar. Outside the door, the summer pre-storm wind makes The Eagle and Child pub’s sign creak and groan slightly. The sound is akin to a rusty door opening, welcoming the weary traveler. The energy between the two men is electrifying the air in the pub. Hobbits, elves, mythical beasts and talking animals take over the conversation. J.R.R. Tolkien and C.S. Lewis laugh out loud. 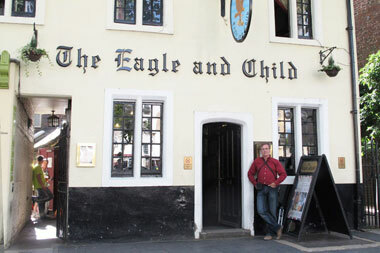 The magical atmosphere that saturated the Eagle and Child pub in Oxford some 60 years ago is still tangible and very much alive. With great respect we sit down at the same table that was home to Tolkien and Lewis, who were members of a group of authors called the Inklings. This is where they once fought their word battles. The presence of both men and all their creations can still be felt. The door to the Otherworld, the world of Middle-Earth, the Shire and Narnia, was open decades ago and still whispers its secrets to those that can hear. 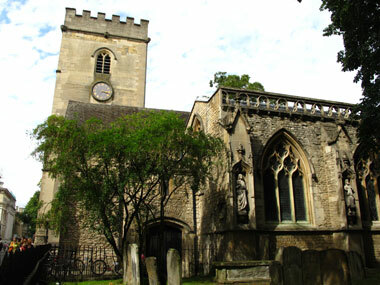 Only hours earlier we were walking High Street, we heading towards St. Mary Magdalene, an England parish church on Magdalene Street. One of our great loves is to research medieval churches and cathedrals throughout Europe. These are like books written in stone, glass, and symbolism. For us, they are doorways to times past, and we sensed a strong inner knowing that there was a clue for us in this particular church. Inside the beautiful and exquisite Magdalene sanctuary, a woman was lighting candles near a stained glass window depicting Mary and Jesus in the garden just before his ascension. We were staring at the window and the words underneath it which Christ spoke to Mary Magdalene, “Do not touch me, for I have not yet ascended to my Father” (John 20:17). Out of the blue, the woman said to us, “Jesus meant do not cling to me and attempt to go through the doorway with me to my Father. Jesus had given Mary Magdalene the keys to the door, but she must find the doorway on her own in her own time.” We were both stunned by the intensity of the message and could feel the importance of this information. A few days earlier we were attending a lecture by Dr. Simeon Hein, founder of Mt. Baldly Institute, in Boulder, Colorado USA. Dr. Hein lectured about the activities of his Institute, about remote viewing. 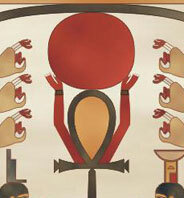 Remote viewing is closely related to shamanic seeing and metaTracking. 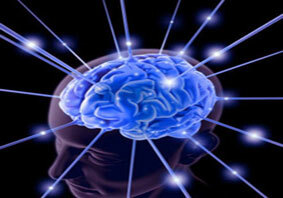 Remote viewing is the ability to see something that is hidden from physical view. This hiding is not necessarily limited to an object being out of sight around the corner or in a sealed envelope. It can also be ‘hidden’ in another dimension and be right here, right next to you. Einstein and other parallel reality theoreticians believe that these other realities are less than an atomic dimension away. Are these parallel realities and the Otherworld of Tolkien and C.S. Lewis one and the same? And does remote viewing open the doorway to them, to the Otherworld? Bit by bit the pieces of the puzzle fall together into one big picture and the magic glue that connects all these seemingly unrelated pieces is DMT. 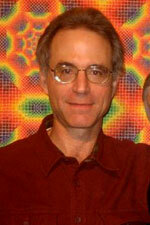 Dimethyltryptamine (DMT) is intimately connected with Rick Strassman, MD, author of ‘DMT: The Spirit Molecule’. After five years of clinical research and administering DMT to 60 volunteers, Strassman concluded there’s a biological component to spiritual experiences – experiences that range from a Near Death Experience to an otherworldly mystical occurrence. His volunteers reported a variety of amazing experiences. 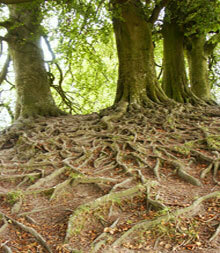 It seemed they had fallen down Alice In Wonderland’s rabbit hole or met the Hobbits in the Shire. It was common for the volunteers to encounter little people, elves, fairies, and wise, enlightened masters during their DMT experience. Experiences where the Otherworld became visible, tangible, and this induced a dramatic life-change for them. We are not talking about hallucinations like those triggered by LSD. 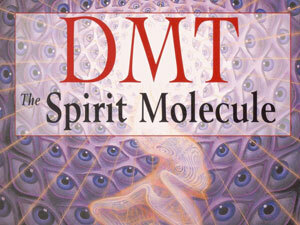 According to Strassman, DMT opens the door to other worlds that really exist. Strassman furthermore discovered that the pineal gland can release varying quantities of DMT on its own. When this happens in sufficient amounts mystical experiences, similar to the ones his volunteers reported, may occur. And ... for thousands of years, the jungle shamans of Peru have utilized a plant medicine called Ayahuasca that assists them to travel beyond this 3-D reality. 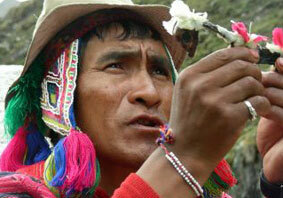 The active substance in Ayahuasca is ... DMT. Amazing! Especially when you see it in the light of Dr. Hein’s presentation. The mere act of remote viewing itself triggers the pineal gland to release DMT, which enables the viewer to ‘see.’ But there is more. Not only remote viewing has this quality. 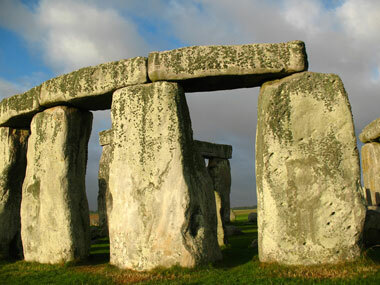 Power places like Dragon Hill near Uffington, Stonehenge and Avebury can have the same effect. Tolkien himself travelled on a regular basis to Avebury to sit under his favorite magical tree. His tree is still there, guarded by elves and gnomes. It is getting crowded at the table we are sitting at in the Eagle and Child pub. Hobbits, elves, speaking animals. They are all vying for our attention. Their unintelligible whispers saturate the air and fill up our heads. Then, all of the sudden, the words are crystal clear. Two people laugh out loud. We! Of course. 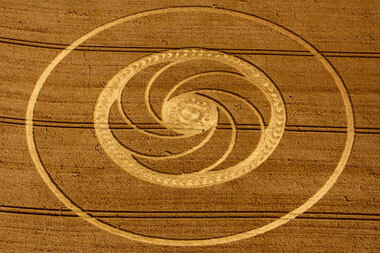 Remote viewing, crop circles and standing stones. Bring them together and not only will the door open, one can also enter through it and step into the Otherworld. A lightning bolt of recognition flashes between us. A new truth began to birth itself into our minds. We had already done it without being consciously aware of it. We have had experiences in places like Avebury and West Kennet Long Barrow where, without realizing it, spontaneous remote viewing had occurred. We had unconsciously already stepped through Tolkien’s doorway resulting in encounters with mythical animals like Cŵn Annwn, the guardian of the Otherworld, and Nazgûl-birds, with strange magical sounds, and balls of light floating over the crop circle fields of Wiltshire. So many events and the light never turned on – we never connected the dots, until now. We both shake our heads in agreement and acknowledge that we have to go back and consciously incorporate remote viewing into our experiences. 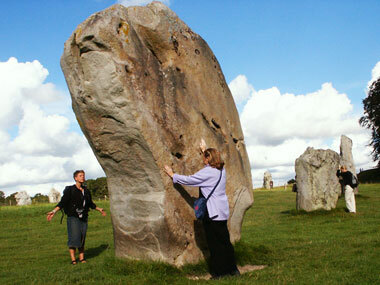 We have to go back to the magical standing stones of Avebury and Stonehenge. 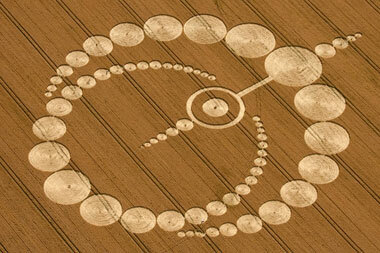 Back to the mysterious crop circles that every year are sprinkled throughout the mythical landscape of Wiltshire. We encourage you to travel with us. To Dragon Hill near Uffington and Wayland's Smithy. To Silbury Hill and the West Kennet Long Barrow. To the Sanctuary and the Circle of Kings. To the Stone Avenue and to Merlin’s Mound in Marlborough, the grave of the great Magician Merlin. To the land of the crop circles where the veil is thin and the door to the Otherworld is wide open, and to Oxford -- the city of great minds and master architects of the Otherworld -- to the Magdalene church and the Eagle and Child pub. Come with us and let 2019 be the year that you not only see the doorway to the Otherworld, but also walk through it. Master remote viewing in sacred places, and enter through Tolkien’s doorway to the (Wilt) Shire and beyond. Come with us on our 2014 expeditions to the power places of England, in the footsteps of King Arthur who was seeking the Holy Grail, Tolkien who was seeking the higher wisdom, and Einstein who was seeking the doorway to other dimensional realities. Our tours in England are not meant for everybody. You have to be curious about the Otherworld, have an open mind, and be ready for the unknown, because we never know what we will encounter.